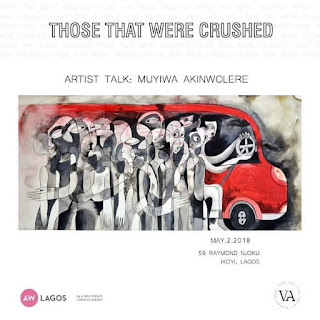 I wanted to stay up-north to practice but ... - Muyiwa Akinwolere, Visual Artist. 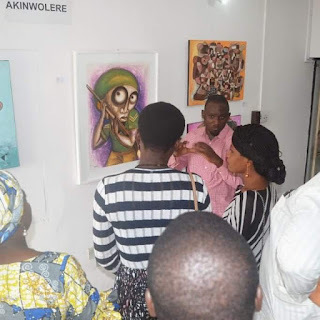 Muyiwa Akinwolere studied Art at the Obafemi Awolowo University, Ile-Ife. 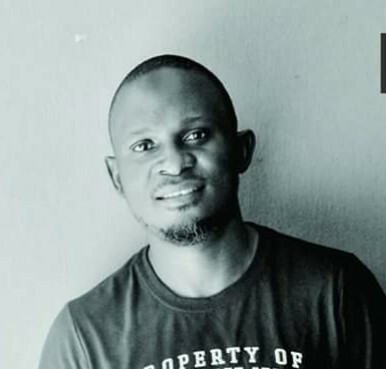 He worked as an Art teacher in Minna, Niger state for 5 yrs before leaving the classroom to go into full time studio work. He owns the Adiitu Studio in Badagry, Lagos state. 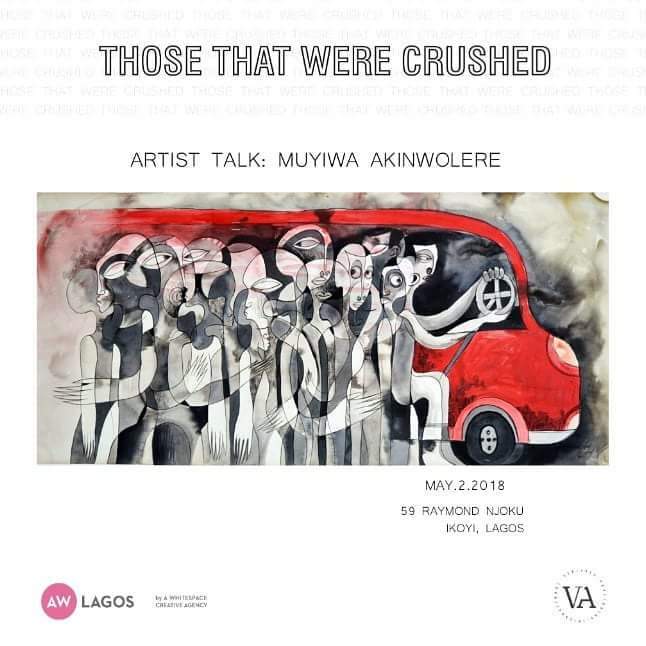 His (antique inks and metals) artworks entitled Those That Were Crushed are currently on exhibition at the Whitespace Gallery Lagos till May 5, 2018. In this interview, he recounts his Art journey from Minna, where he started practice about two decades ago, to Lagos where he now works and lives with his family. 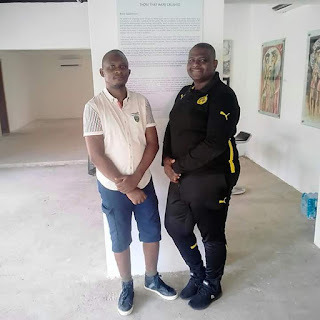 In Minna, I collaborated with Baba Sokomba and Francis Sokomba at Gabajudah gallery. I was using my free time at that time to make art and display at Gabajudah gallery. Eventually when I left teaching, I worked with Gabajudah as a resident artist before I started my own studio in Minna. My studio that time was known as Nubia arthouse. It was located inside the defunct Federal Mortgage Bank along F-layout. I have always wanted to practice full time. Teaching actually happened because of my posting to a school as a corp member during my service year. 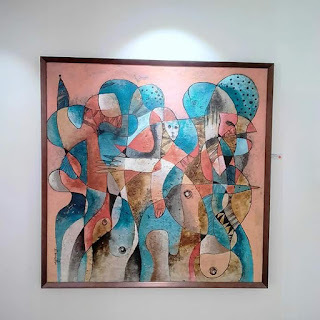 Artwork by Muyiwa Akinwolere currently on exhibition at the Whitespace gallery, Lagos. Abuja was a different terrain. My art in Abuja found expression because there were more galleries and art exhibitions where you can display your craft. 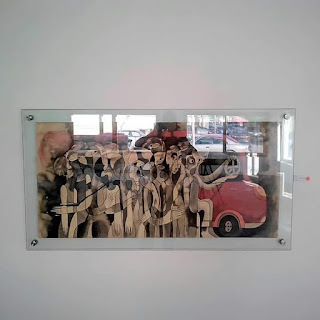 Lagos is the art capital of Nigeria. It was a gravitational pull. Moving to Lagos positioned my art to be more visible. It is sad though because I really wanted to stay up north and practice. But, at a point in my life I needed to face the realities. Coming to Lagos was going to afford me opportunities that I wasn't going to get in Abuja. My first show in Lagos was at Pan African University Lagos in 2011. And since then, I have had 3 solo exhibitions. I participated in Lagos Diaspora festival (black heritage festival ) art exhibition in 2010 , Lagos Biennial 2017 and many more group shows. What is he showing now? My ongoing exhibition is called ‘Those That Were Crushed’. It is a body of work that illustrates the politics of war and the impact of terror especially in Nigeria. It is a bit of satire and sarcasm. I have been experimenting with hantu traditional dye extracted from leaves used for Arabic calligraphy. I mix hantu with a combination of other inks in a technique I dub antique ink. Where he draws inspiration from? My greatest inspiration is God. But I love the the work Kanebi Osahenye, Demola Ogunajo and recently Anselm Sceifer and Ai Wei-wei. What will the artist talk tomorrow May 2? The art-talk is to generate discussion about my ongoing exhibition. I am going to be talking about what informed my creation of these series and the process of making them. I recently have been working with recyclable materials like Soda cans and aluminium printing plates. I re-purposed them as works of art. Adiitu, well done. More power to your elbow!